I have been fiddling with flour types and quantities for my regular weekly bake using 123 as the base formula with an overnight proof in the fridge (~4C). I enjoy a mix of white and whole wheat, and recently added some rimacintata. 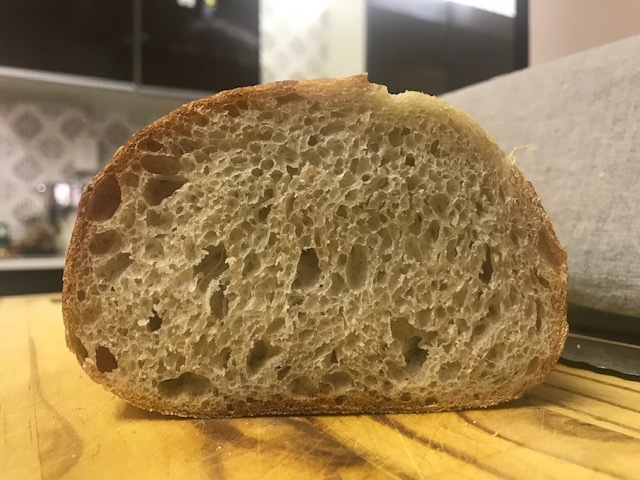 I am really pleased with the results I am getting with 61% white, 21% whole wheat and 18% De Cecco semola rimacinata - quite a delicate, tasty and moist, but not gummy, crumb. The main pic was (slightly over-) baked this morning, the one inserted below is from mid-October. That looks good enough to eat 😄. Lovely loaf. Too good not to eat! Perfect crumb with a nice thin crust. Looks delicious.